year 2003, circular inscription REPUBLICA MOLDOVA meaning "REPUBLIC OF MOLDOVA" and the coat of arms of the Republic of Moldavia, in exergue denomination "10 LEI" grapes and grapevines leaves, a traditional wooden can for vine and a wooden drinking cup, below the inscription "SĂRBĂTOAREA VINULUI" meaning "CELEBRATION OF THE WINE"
The coin was struck at the Romanian State Mint, having a maximum mintage of 3000 pieces. Until today (January 2013) the series Holidays, culture, traditions comprises the following 50 lei silver coins: pottery in 2007, cooperage in 2008, weaving in 2009, traditional musical instruments in 2010, carroling - colindul in 2011, Sînzienele and Mioriţa ballad in 2012. 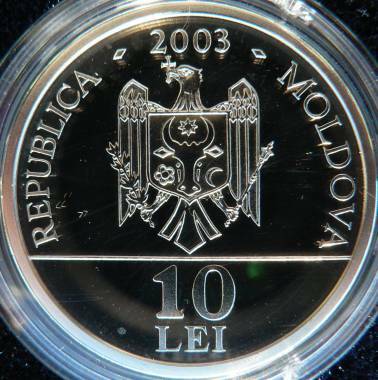 In August 2008, a circulation coins set was issued by the Moldavian National Bank, comprizing the circulation coins of: 1 ban 2004, 5 bani 2005, 10 bani 2005, 25 bani 2005, the brass 50 bani 2003 and this special issue of 2003. Accordingly to the English description in circulation coins set pamflet, the English name of the coin and celebration is Feast of the Wine. In the Republic of Moldavia the national celebration of wine takes place each second Sunday of the month of October. Thus the old Latin originated tradition is confirmed and oficialized. In România the celebration of the wine is not an oficial event, being organized locally by the municipalities, particulars or wine companies. Prince and scholar Dimitrie Cantemir (1710-1711) wrote in his book Descriptio Moldaviae - Moldavia's Description - about the main beverage of the Moldavians: that was the produce of the grape clusters featured by the Moldavian coin as symbols of the so reach in grapevines Moldavian soil. Moldavians "feel not too queasy because of the beverage, yet also they are not too addicted to it either." During winter especially the Moldavians warm their limbs with wine, their main beverage: "Booze is not loved by anyone, except the soldier; others drink only a small glass before the meal." In no way was Dimitrie Cantemir intending to picture the Moldavians as apart of the other Romanians in which the culture of wine drinking was concerned, yet only in pointing that drinking wine was a deeper and more prized customary behaviour in all social classes. The work reassesses the priority of Moldavians among Romanians as wine drinkers: "Once a quarrel arose whether the Moldavians or the Walachians were the most eminent imbibers. Those quarrelling went to the bridge in Focşani (at the border between Moldavia and Walachia), where so long did they both quarrel with the glasses until the Walachian fell down because of the so much wine he had been drinking. As reward for his victory the Moldavian was gifted by the princedom with nobility." 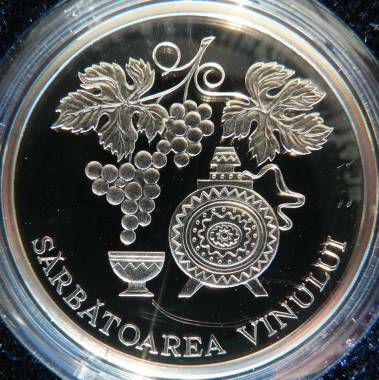 On the circulation coin of 50 bani of the Republic of Moldavia grape clusters are represented as adornments. The link below leads to one of the 250 lei series from 1939-1941, another beautiful Romanian coin adorned with grape clusters, 250 lei 1941 - TOTUL PENTRU TARA.